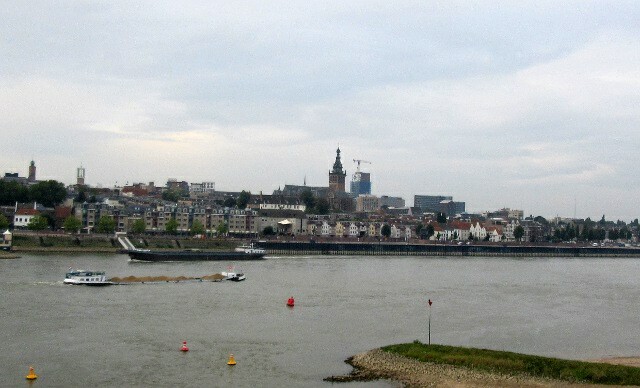 Arnhem to Aarschot cycle tour. 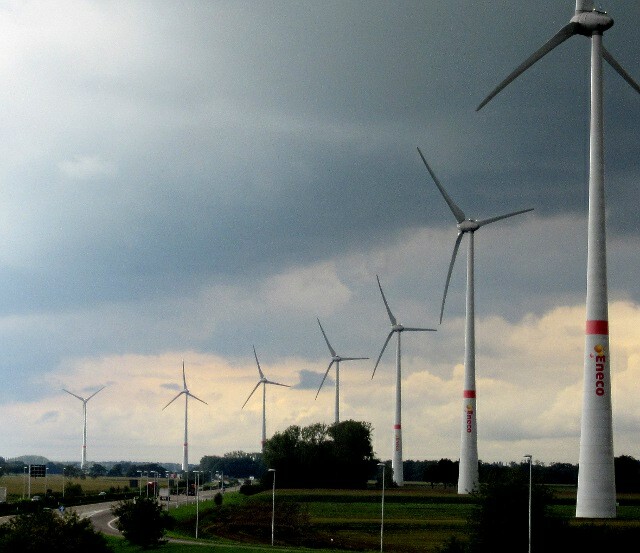 Netherlands and Flanders – just because it’s flat doesn’t make it easy! A few weeks ago I found myself in the Netherlands for the opening of the new Gazelle factory in Dieren..
As this event went into the evening it required an overnight in nearby Arnhem which in turn left me wondering how to make use of a Friday in the area? Theoretically I could just jump on a train and be home in a couple of hours but I rather fancied doing some cycling because I have never really had much time to just cycle around in the Netherlands which is a serious failing for someone in my world. 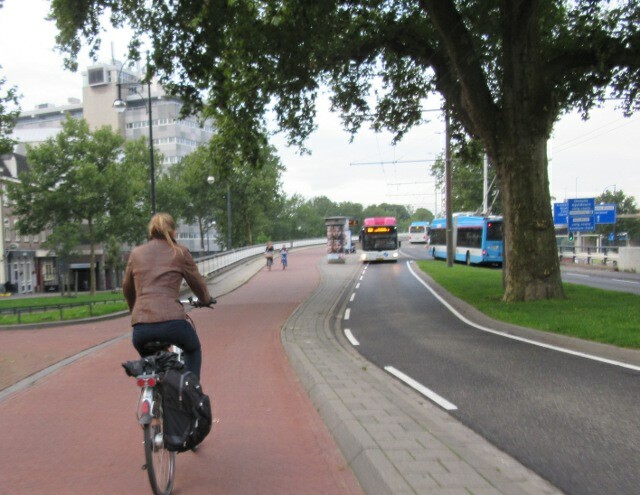 I particularly wanted to ride the Arnhem to Nijmegen on the fast cycle route that I had heard about from study tours to the area and which features strongly in the Arnhem-Nijmegen plans for Velo-city in 2017. 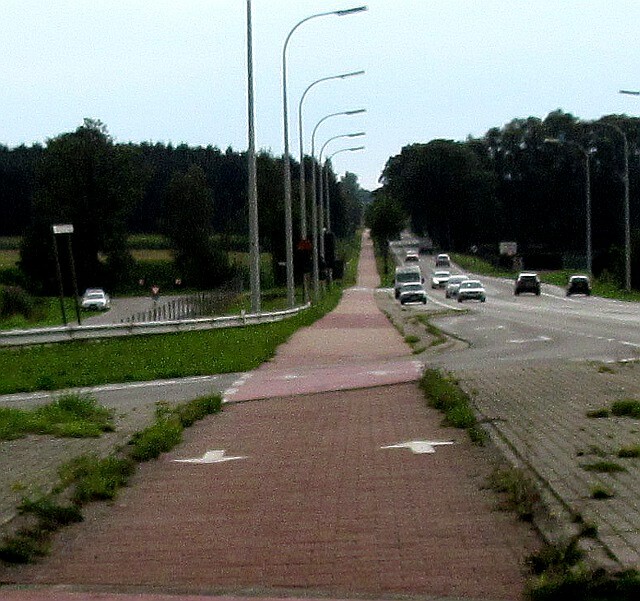 Then I hit on the cunning plan of combing both options – to bike home from Arnhem to Belgium, or rather to set off roughly southwest and just see how far I could get, and while doing so to take in some Dutch infrastructure and countryside. It is the kind of ride I really like, a chance to strike out cross country with a destination in mind. In this case what could go wrong? Pancake flat so no problem carrying a bit of luggage, great cycling routes and a good network of railway stations to aim for in Flanders. 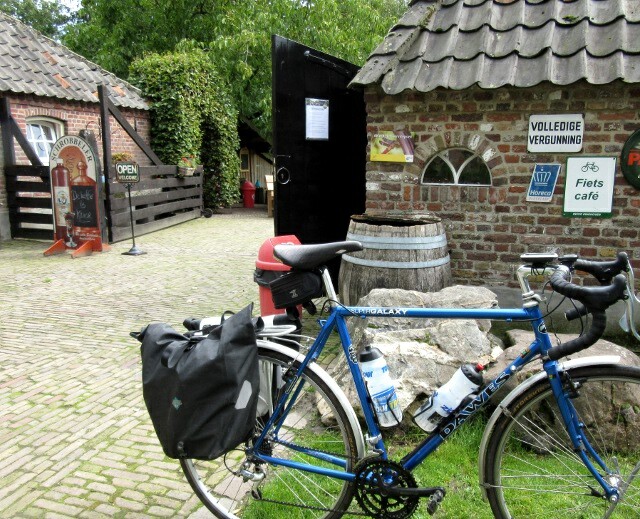 The ride delivered in many ways as I hinted at it in a sort of teaser blog post just after the ride “British cycle tourist in the Netherlands – what I am really thinking”. This longer blog post enables me to flesh out those short thoughts with more impressions and commentary on the ride. But I have a confession. It wasn’t quite the idyllic roll through the countryside that I had in mind in during the planning stage. That is completely the result of my stubbornness. Firstly I looked on the maps and spotted that Aarschot in Flanders was a good rail hub almost 165km from Arnhem by bike. Perfect. An incomprehensible decision perhaps except to British and American readers who may spot that 162km is an old fashioned Century Ride, 100 miles, which would be a great milestone for perhaps my last long cycle touring day of the year. Once I had decided that this was my plan I shoved some way points in my GPS and stopped thinking about the ride until the day. Which is my excuse for completely ignoring the fact that the weather forecast had changed from a benign high pressure system with light winds to a stiff south-westerly with rain in the breeze. And even when I discovered the weather change I somehow concluded that it was still a good idea to ride 165km into a head wind in a landscape renowned for its openness and flatness and on infrastructure that can be exposed at the best of times. Which was just plain dumb. I could easily have decided to do a nice circular tour on more scenic routes and just gone home a bit earlier on a different train. I could have decided to ride North East instead, although given the wind I probably would have been phoning home going “sorry darling I’m in Denmark” which would have been more than complicated. Which is why I also have to confess that this blog post is not exactly the travelogue I thought it might be at the outset. 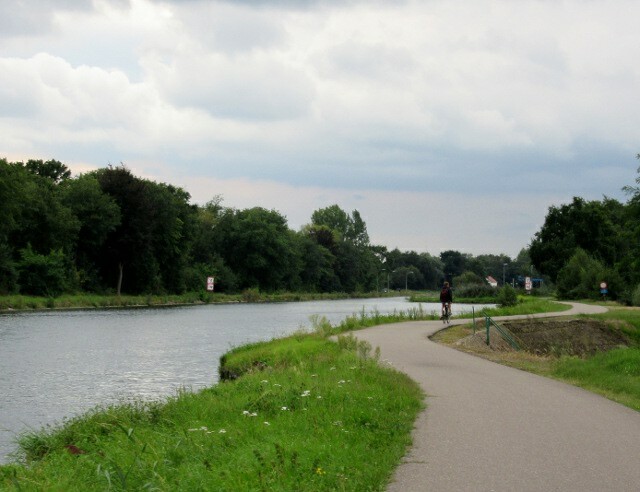 I have pretty good recall on the wonderful Rhine-Waal fast cycle route between Arnhem and Nijmegen which was my first ambition. 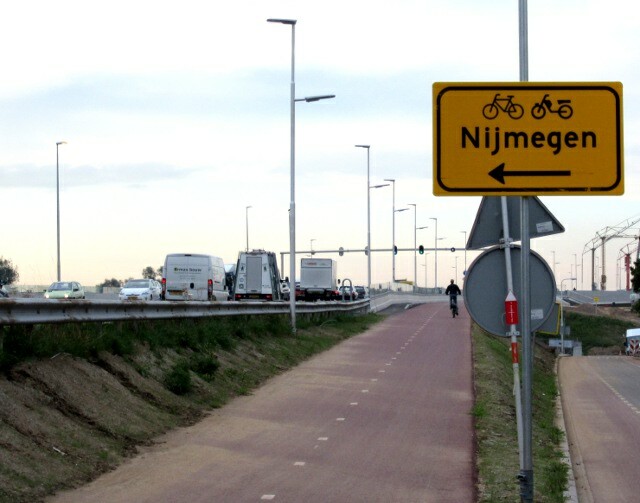 But after a while I began to become a bit numbed to the huge Dutch cycle routes beside massive infrastructure like motorways because they were exposed, noisy and not exactly scenic, even if they are the most extraordinarily high quality and efficient inter-urban cycle routes in the world. And towards the end poor Flanders got limited attention because bluntly I was stuffed and riding on autopilot, still pigheadedly headed for Aarschot, because that was where I was going. 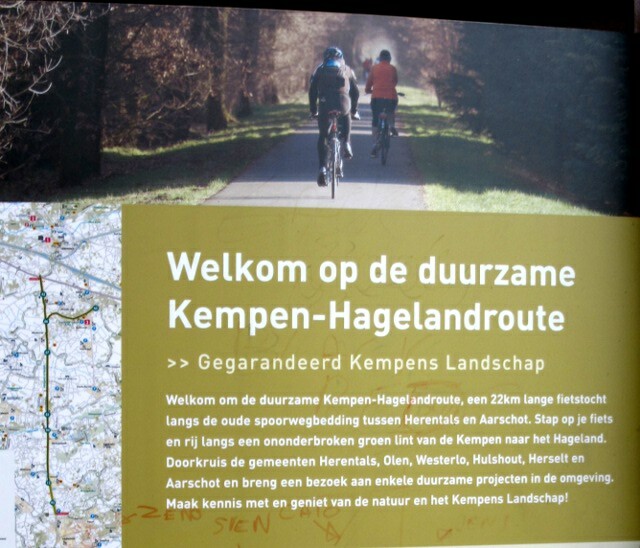 Which is a shame because the last part of the ride should in many ways have been the best, the Kempen Hageland cycle route into Aarschot from the north is a very attractive and well maintained route along an old railway line right into the town. So rather than write up the ride as a journey I have decided to pick out some clusters of images that will stick with me far longer than those rather brain dead moments towards the end of the day. 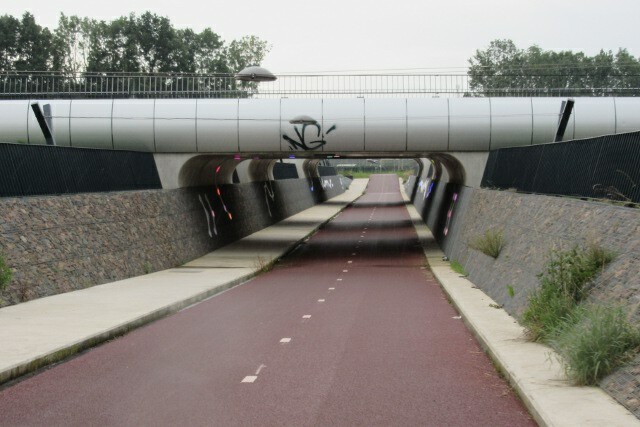 Of course it could not be a ride across the Netherlands without a commentary on the infrastructure. 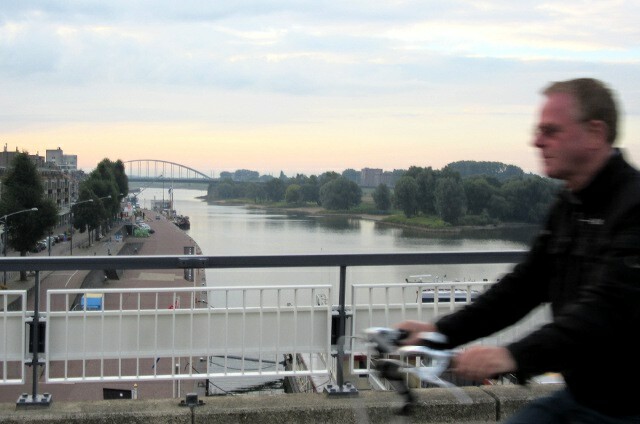 Which started from the first few metres as the incredible new high speed bike route between Arnhem and Nijmegen started right in the heart of the city with a high bridge crossing the river Waal from the railway station, continuing as a high quality corridor most of the way. I diverted off it a couple of times where it is not quite complete but overall it gave me an impressive trip to Nijmegen 17km later. But this was only the start, I was on and off broad superhighways all day. Even when I got to Flanders the surfaces may not have been quite as perfect, but the scale was impressive. The other thing that struck me was that much of this infrastructure was apparently deserted, except at school run times where it got a bit busier. I hope and expect it was much busier at commuting times. The contrast to these cycling highways were the many towns I passed through and when I did drift away from the big corridors there were some charming villages. It is not only a contrast in scale, I think so many in the cycling world think the Netherlands has a cycle route on every street but I always feel it is important to emphasise that almost none of the town and village centres have bike lanes, they depend on traffic calming, surface treatments and the discipline of their drivers who just accept that cyclists are respected users of the streets so they wait and keep their distance. Especially the kids who travel like flocks of birds, swooping and chatting, confident in the fact that they are masters of all they survey. It started with the morning in Arnhem as they zoomed past the drunken aardvark sleeping off his hangover. They were all over the routes between Arnhem and Nijmegen, then later in the day as after I crossed the border into Flanders it was marvellous to be forced to wait for several minutes as seemingly every kid in the town rolled out of the local school at the special crossing patrol for the young cyclists. What else? Cake. And Coffee. Lots of it. Because it was really needed this time, I feel like I survived in those big slices of Dutch apple cake and the very excellent Fietscafe (cyclists café) that popped up at just the right time as I rode round the lanes near Eindhoven. To finish a low and a high. Just before I turned onto the excellent Kempen-Hageland cycle route for the final 15 kilometres of the ride I had a section I had originally put into the route because I thought it would be a nice change from the roadside bike lanes in the Netherlands. 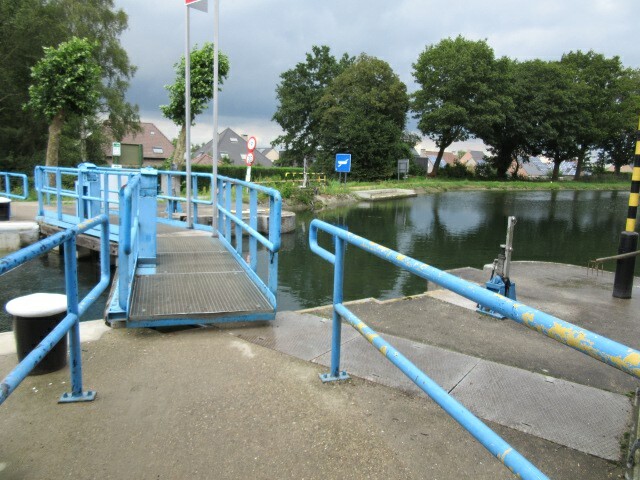 A nice cycle route by the canal to Herentals should have been perfect. Unfortunately it was also bang-smack into the wind with even less protection than the roadside routes as the wind appeared to funnel down the canal. I was fading fast I must admit. 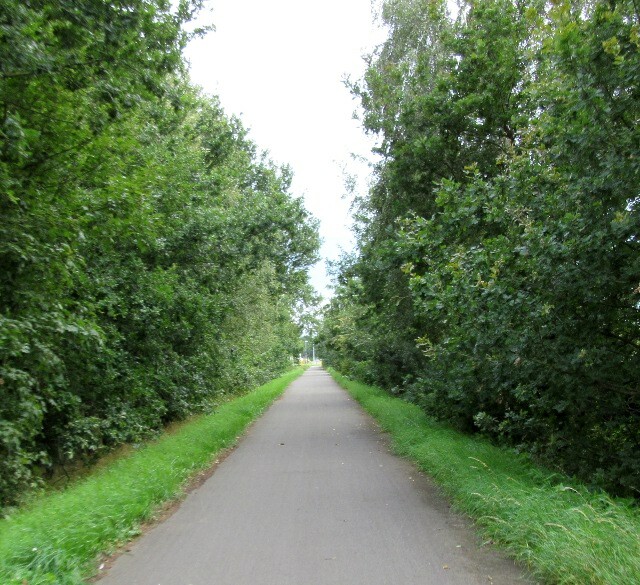 To turn 90 degrees and only have a side wind down to Aarschot was a relief, especially as the former railway line had possibly the most consistent tree cover of my entire ride. I have rarely been so pleased to finish a ride and let the train take the strain for the final hour of my long day out. Apparently the people of Arnhem get a bit fed up because most people outside the Netherlands only know the city because of the Second World War based film “A bridge too far”. Maybe Arnhem to Aarschot was my version – a few bridges too far. 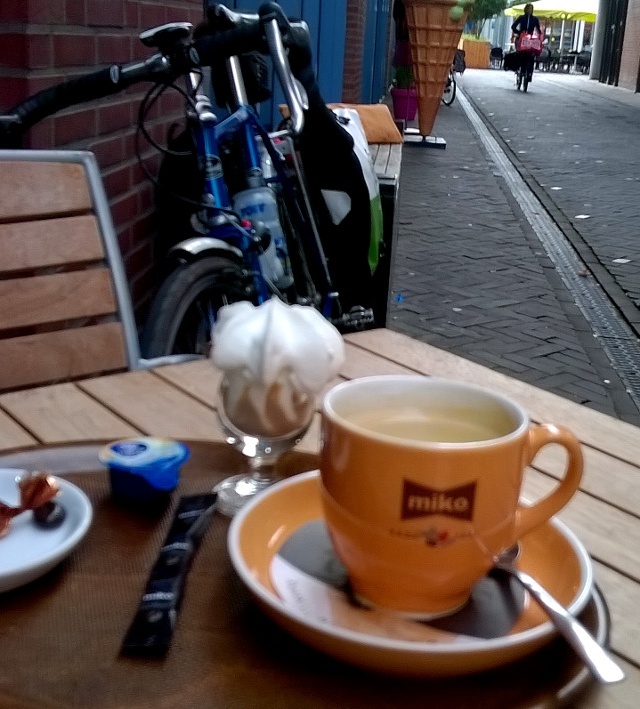 This entry was posted in Great rides, Musings and tagged Belgie, Belgium, cycle touring, cycling, Flanders, Netherlands, Vlaanderen by kevinmayne. Bookmark the permalink. (via Bicycledutch channel) What you have here, is the explanation, why the Tour de France teams protect their no1 rider, all the time. It’s the wind, that slowly, and surely, drags you down, to the level of the average cyclist. It’s WIND. So as a dutchman, I NEVER go out, without looking up wind direction in the local meteo http://www.meteohoogeveen.nl/. Mostly it’s WEST, and SOUTH. And as this trip is west and south…your typical dutch cycling conditions. 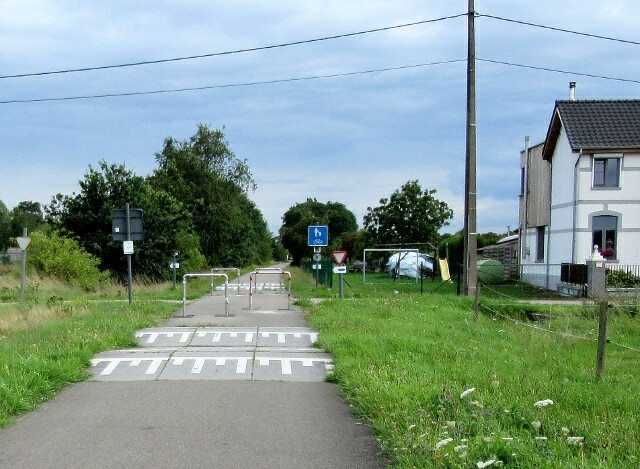 🙂 So to the writer of this article, I must say, you’ve passed the exam for dutch cycling…you arrived! and did not give up! Dutch longer distance cycling school kids applaud you, (they have to do it every day). That said, they are, as you noticed so clearly, in large flocks of cycles, and so they can share the burden. Do they take the bus after a while?, to which I answer, can you miss all the best gossip? So It’s the bike! or be the last to hear about it. The even more stupid think is that I come from the English flatlands across the North Sea from the Netherlands so I know about windswept landscapes. So that makes me even more stubborn for deciding to carry on regardless of the wind, I really should know better. I know, I hate myself (for stubbornly pushing on) sometimes too, but when I am alone, then I try to make a cyclist-training out of it, I start to watch my posture, the technique of how I push and how long I extend my push (don’t push to the maximum possible straightening (is that a word) of the leg)…and I look down a lot, to my feet, and I stop pushing to keep up my forward speed so hard,…until I come in ‘THE rhythm’, time stops… effort becomes less so (You won’t hear me say effortless), but still… that long straight stretch against the wind…you don’t feel depressed…it becomes…a positive experience, (those pain suppressing molecules that the bodies of long distance runners make, kick in?) and when I reach that bend in the canal (the stretches along canals are the worst if you go against the wind)…I can almost hear myself…hey that wasn’t too bad! It’s sometimes about how to learn to fool yourself, the ability to lie to yourself,…that helps you against the wind. This only works when you are alone. Humor might help if you are together, or off the cuff questions (did we just do 4 (Lying is required) km ?). Music does it for me when I am alone. My son says I always lied when we were touring together – of course I still deny it, I don’t want him to be able to blame his father for any bad habits he may get.. The pro teams can afford to pay for big Dutchmen and Belgians to go and ride at the front. Always popular with the rest of the team on those days. Checking the wind is fine when you are riding in one direction. Most of my routes are circular, and the wind always gets you in the end! When I was a kid part of the accepted cycling folklore was that you always ride out into the wind so you can have an easy ride home. I still do that almost automatically for circular local rides, it definitely works, of only in the mind. You are correct, however I experienced that there are limits to that statement. The ultimate circle is the ‘go to your mum who lives at 31km, (against the wind, only 2-3 Bft :-), this time), do the visit, then say you have to leave before dark, which you don’t… and when you leave, find out that your big bonus (the wind will finally be at your back).has been voided, by the well known effect that winds tend to settle down at dusk…bummer.